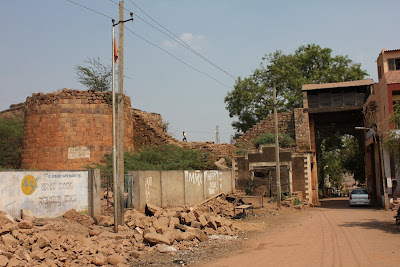 Though Torgal-Ramdurg is a short drive, we were feeling the midday heat. We could see the fort walls as we approached Ramdurg. 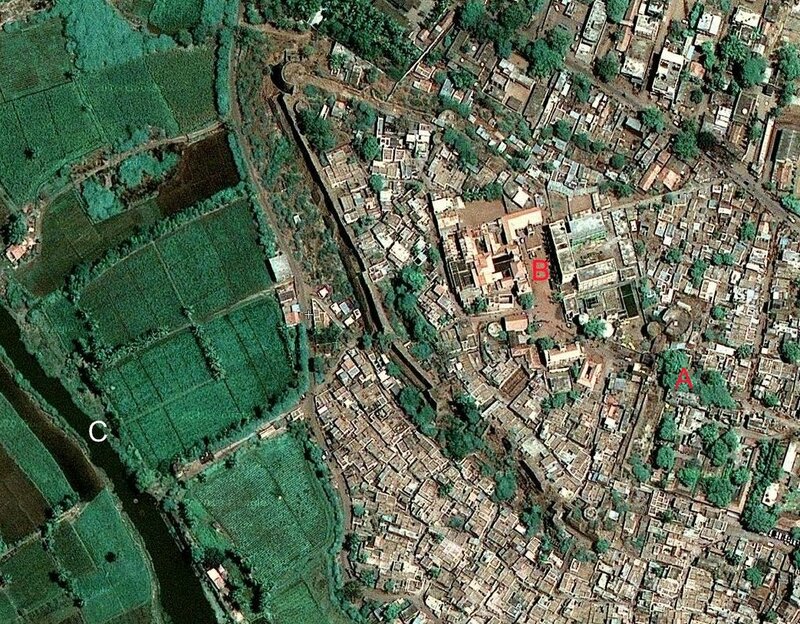 Once inside the busy town, the fort vanished from our sight. Ramdurg town has grown out of the fort and spilling on the sides. 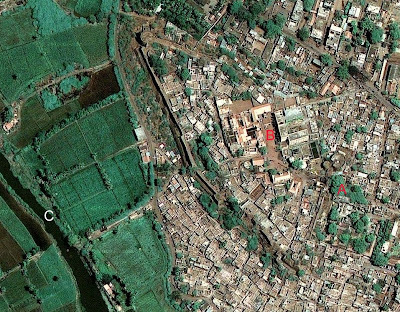 The fort is swamped by houses with narrow streets between them. Chetan wanted to have something cold, he got a 2l Sprite bottle. It did help beat the heat at that moment. We got directions and went up a short uphill road leading into the fort. That's the only gateway. Plenty of new constructions. 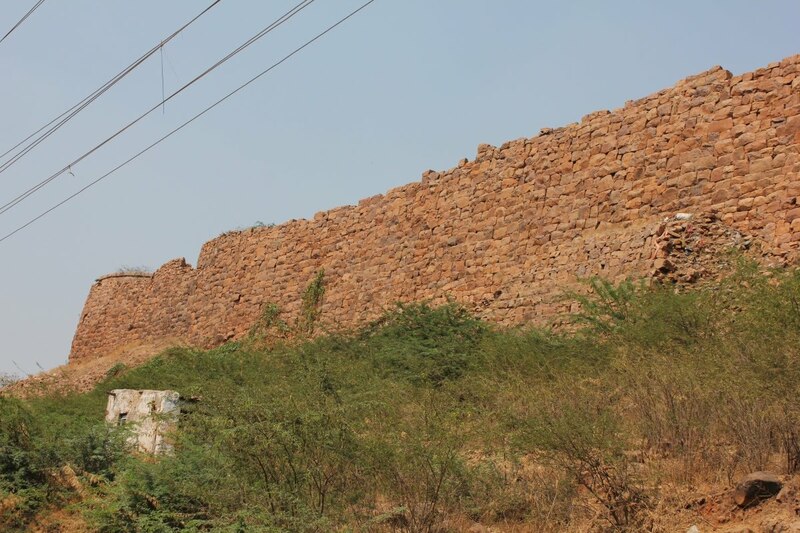 If a mason falls short of few stones, just pick some from the fort walls here ...it could be happening. Inside the fort, we parked in the shade cast by an ancient building. 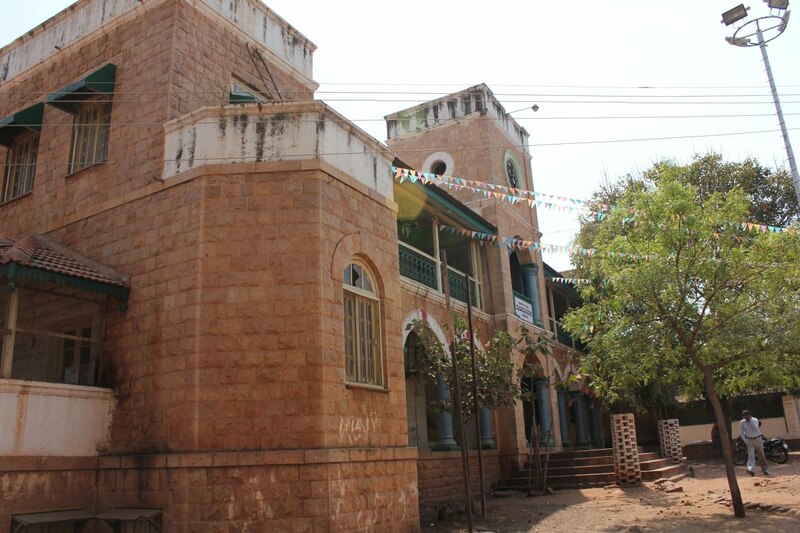 A modern building stood opposite, a board identified it as some college. The ancient building also had a black & white board proclaiming it some college. 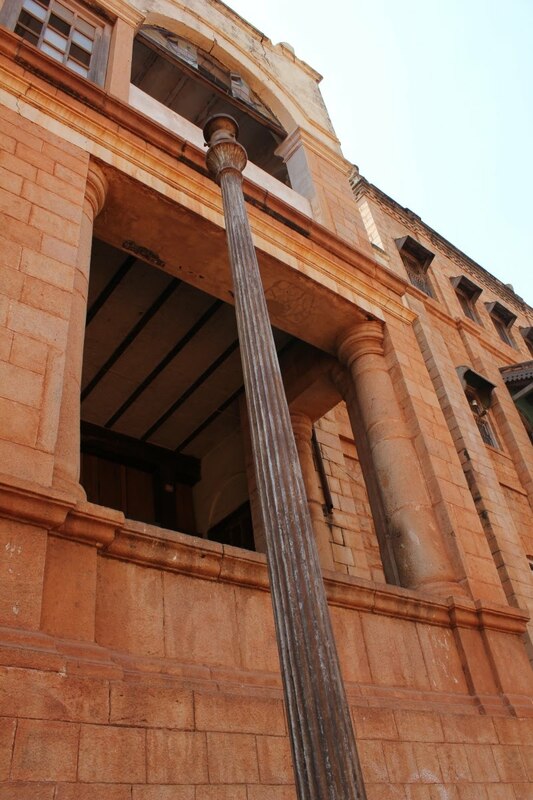 I assumed the building to be of British era. A man was sitting on a platform was watching us, he seemed to be a guard. 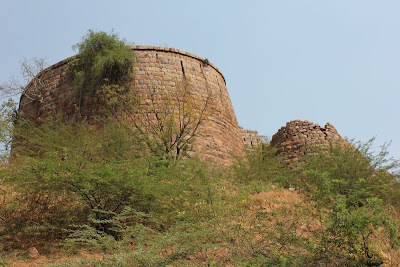 We rested for a while looking around, thinking whom to inquire about the fort. On a hunch I asked the guard and learnt that this building is a palace. Wow! The guard slowly opened up. 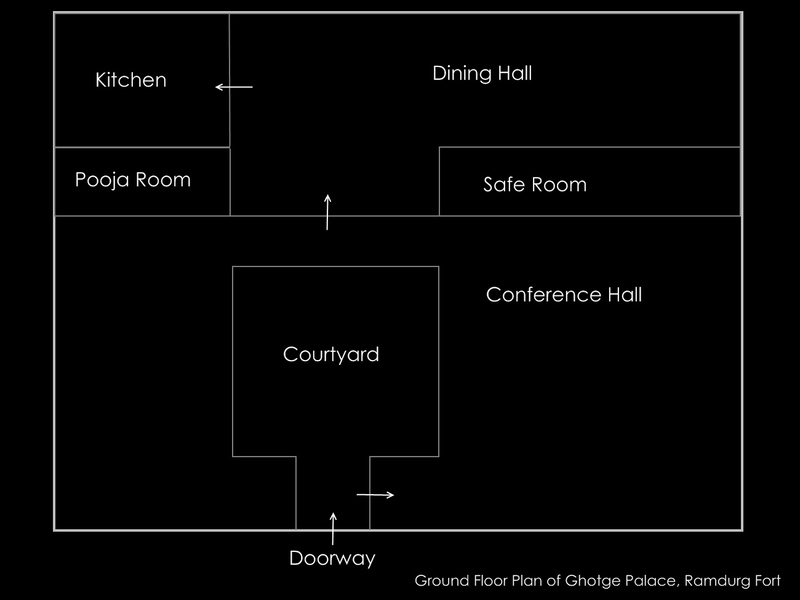 This is Ghotge Palace, present owner lives in Poona and visits occasionally. I ask if I can peep inside from the opn door. He actually invites to step in but requests us not to shoot. We agree, take off our footwear and step into the palace. Our guide, cannot remember his name, told us that furniture and household things are moved to a different place. 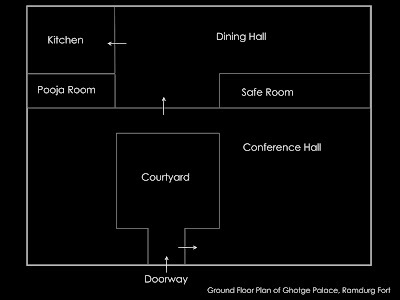 This is the approximate layout of the ground floor. The first floor had gallery right above the conference hall and probably bedrooms. The conference hall had couple of heavy wooden tables and chairs, we did see a book which looked at least 80 years old. the guard with us all the while. 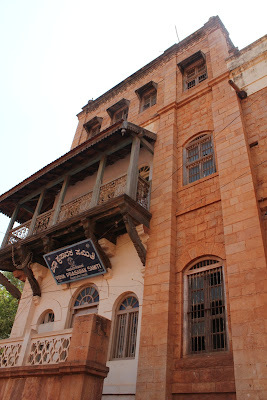 We saw few pictures; one of the Maharaja and his son's picture was also seen. The present owner is the Maharaja's granddaughter. The safe room had strong vertical bars like a prison cell. Dining hall floor dirt floor smeared with a layer of cow-dung (this is common in rural homes). Once a year feast is served after pooja. The dining hall could seat 50 to 60 people. The kitchen had a huge water tank of it's own and had a door to the back yard. We could see the pooja room also, I did namaskara to idols inside. A poojari performs pooja everyday. The stairway leading to the first floor would be locked, I did not bother to ask our guard. I was glad to see this much. We thanked our friend and left. This building houses the Municipal Offices, also belongs to the Maharaja. 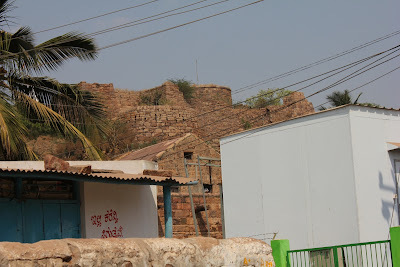 We expected to see some cannons and stuff like that but :( We drove out the fort and went around Ramdurg hill with a hope of getting few decent shots of the fort. Shrikanth stopped on and off trying to get a good view and I would keep shooting without stepping out of the cab. Done with Ramdurag, we drove across river Malaprabha towards Sureban. Few kilometers from Ramdurg, driving through ghat section, we stopped to admire Kolchi Weir. Good coverage of Ramdurg Palace & fort. There was another palace at Turnur- a km away from Ramdurg. Now it a college. When we were 10 yr old we used to go to the palace to see the Yuvraj when he usually used to come during Navarathri. 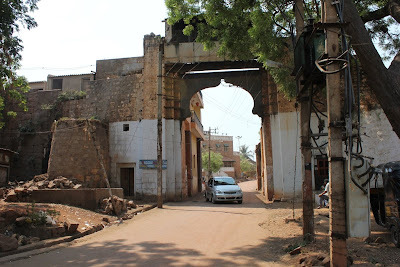 I also used to go with the procession on Dussera with the decorated sword of the Raja of Ramdurg.We used to play cricket in front of the palce. Now it is all history. Syn-chemist and eskepee, it feels good to rekindle old memories.